This month we help the gardeners at 112 Willow St. select plants for their new Quiet/Meditation and Butterfly Gardens. Along the way we’ll discover some good resources on gardening with California native and non-native plants. In November (2014) we start a new series, ‘Maintaining Your New California Garden’, beginning with garden installation. 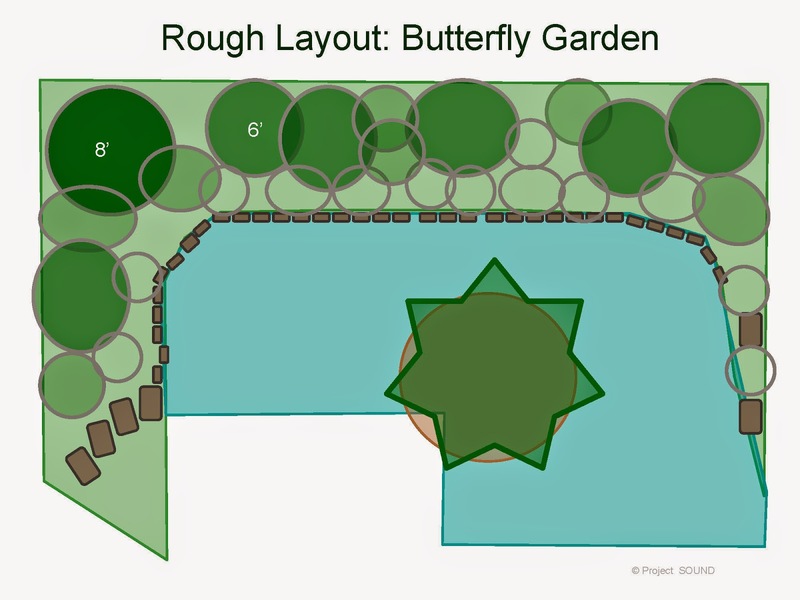 If you’re just joining the ‘Designing Your New California Garden’ series, we suggest starting at the beginning (July 2013 - http://mother-natures-backyard.blogspot.com/2013/07/designing-your-new-california-garden-1.html) and working forward. The monthly activities will help you design an attractive, functional, sustainable and water-wise garden. One of the more challenging aspects of garden design can be selecting the plants. There are so many plants to choose from, even amongst the natives. And most homeowners have only a limited knowledge of them. It’s no surprise that new designers feel bewildered, particularly if they believe that plant choice is the first step in the design process. In Designing Your New California Garden, we approach plant selection in a whole new way. We discuss our philosophy in the first posting (July/2013). In the past, gardeners were taught to choose the plants, then amend garden conditions to suit the plants. This sometimes worked just fine, but was not sustainable. The New California Garden begins with the conditions that already exist; plants are chosen based on their suitability for those conditions. This actually makes plant selection a whole lot easier. By defining the Summary Characteristics of the plants for each garden area (as you did last month) you’ve already done most of the work. The Summary Characteristics allow you to eliminate unsuitable plants and focus on those with the best chance of thriving and bringing you joy. It’s just a matter of finding plants that meet your criteria. Many gardeners like to read about - and see pictures of - candidate plants. Several types of resources can be helpful. Be sure to choose those that are appropriate for the geographic area in which you garden. Whether print, on-line or human resources, it’s best to determine where the author actually works and gardens. His/her experiences and advice likely reflect the area where they garden. Native plant resources are often aimed at gardeners in a particular climate or geographic region. Remember that watering, pruning and other advice may be specific to a geographic area. For example, a plant described as needing ‘occasional water’ in Northern California may require more frequent irrigation in Southern California, with half the precipitation. And Fall pruning is often done later in S. California, to avoid hot, dry conditions not experienced further north. 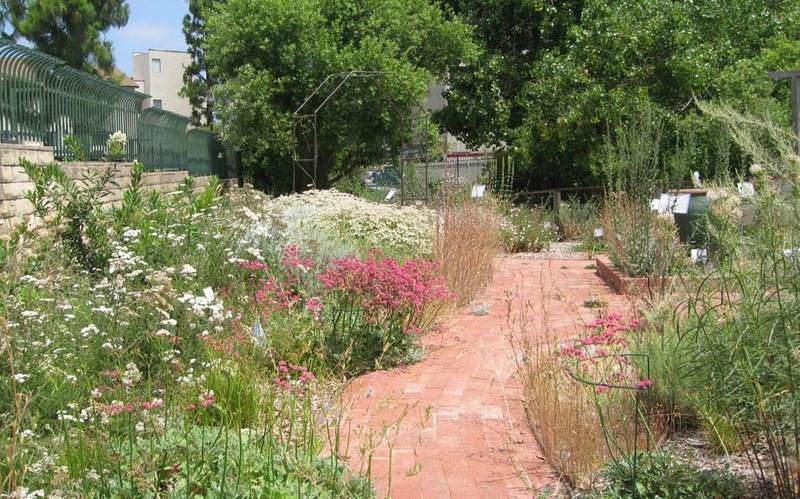 If you live some place other than Southern California, we recommend seeking out the native plant society in your area. They often have people who can advise on garden design and answer questions. Native plant groups/nurseries may have websites or newsletters that recommend locally appropriate plants and other resources. You may want to attend classes or regular meetings to learn more about local native plants. The list of on-line resources continues to expand with the increasing interest in sustainable, water-wise and life-friendly gardening. If you live in western Los Angeles County (or lowland coastal areas of S. California), we recommend the following resources developed specifically for this area. 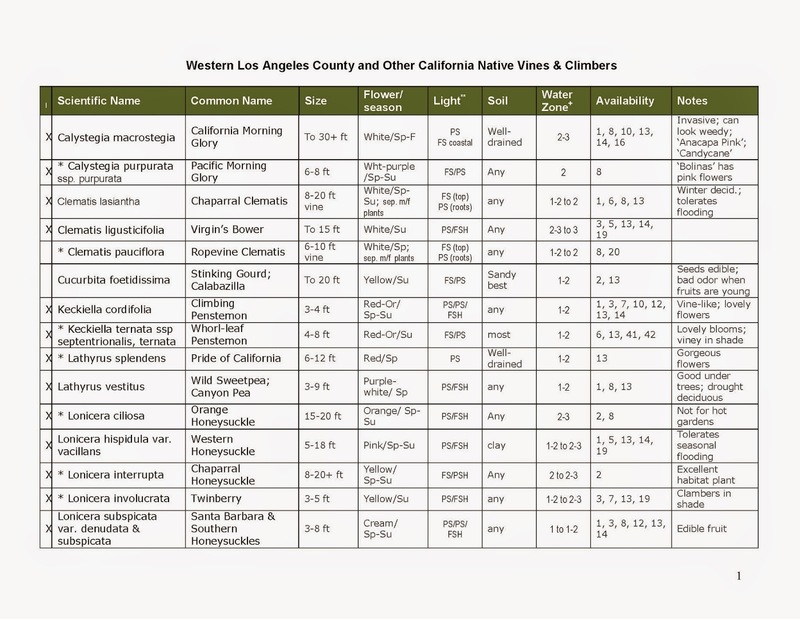 If you know the scientific or common name of a native plant, The California Native Plant Link Exchange (http://www.cnplx.info/query.html) is a helpful resource. It provides information on individual native plants, including nurseries offering it for sale, associated plant species and helpful links to other resources. The Sunset Magazine site and BeWaterWise.com (http://www.bewaterwise.com/) also have useful descriptions of water-wise plants appropriate for S. California. 1. Select plants based on Summary Characteristics criteria. The Summary Characteristics specify the attributes of plants appropriate for your design, climate and yard. They literally describe the plants. When the Summary Characteristics are thoughtfully defined, your plant selection is much, much easier. If a plant doesn’t meet the criteria - particularly the size and cultural criteria (soil type; light; drainage) - then reject it. It’s that simple. 2. Seriously consider the mature size of the plant. In general, plants continue to grow until they reach their normal mature size. This is true even if you prune them. Be sure to choose the right-sized plant for the area. Native plants, particularly the shrubs, tend to grow larger in gardens than in the wild. Assume that the described size underestimates the true garden size; add 15% to the size. For example, a plant described as having a 6 ft. diameter may actually be closer to 7 ft (6 x 1.15 = 6.9 ft). Give your native plants room to grow. Except for in hedges, screens and mowed lawns, there’s nothing wrong with a little extra space between plants. And there’s nothing more frustrating – and futile – than wrestling with a plant that’s too big for the area in which it must live. 3. Choose plants with ‘added value’. If possible, choose a plant that gives you a little something extra: fruit from a shade tree; colorful flowers on a hedge shrub; seeds for hungry birds from a perennial. Your space is likely limited. Choose plants that provide the most value for the space they occupy. 4. When feasible, choose a local native plant over a non-native. Depending on your criteria, some plants will need to be non-native: some fruit trees; common garden vegetables; flowering plants with special meaning to your family. But in general, when deciding between a native and non-native, we recommend choosing the native. Natives have several advantages. First, they are better suited to your climate, soil, precipitation and other factors. They will need less supplemental irrigation, soil amendments and other amenities. Second, they will often be much less prone to pests and diseases. Natural deterrents keep these problems in check, saving time, effort and money. Third, these are the plants that local birds, insects and other living creatures depend on. A ‘butterfly bush’ from Australia may not be effective in California; its butterflies live in Australia. Native plants, their pollinators, browsers and distributers have lived together for a long time. Keep the circle of nature intact – plant a locally native plant. You’ll enjoy your garden ecosystem more than you can possibly imagine! 5. See the plant in a garden setting before you buy. The internet is a wonderful tool for obtaining pictures of plants. But seeing the plant in a garden is even better. Native plant gardens, botanic gardens, nurseries and local home gardens all provide opportunities to observe candidate plants. Note characteristics of the foliage, including the aroma. Observe the growth habit – will it really grow into the shapely tree you envision? What birds and insects visit it? Are the flowers the right color in real life? 6. Seriously consider the disadvantages of candidate plants. All plants have characteristics that may be disadvantageous, depending on their use. For example, a plant that spreads via runners might not be appropriate for a small mixed garden. The same plant would be perfectly suitable if contained or used as a ground cover. A plant may have an unusual odor when wet; or drop leaves, berries or flowers. These could be disadvantages in certain settings. Ask local gardeners, nursery staff or members of a local gardening club/native plant society; many will be happy to share their knowledge and experience. Local gardeners have lived with the plants and understand their benefits and drawbacks. They sometimes are better resources than nursery staff. Learn to read between the lines of plant descriptions. Look for phrases like ‘invasive roots’, ‘invasive plant’, ‘don’t use near water/sewer lines’, ‘spreader’, ‘rhizomes’, ‘vigorous growth’, ‘difficult’, ‘short-lived’ and ‘re-seeds freely’. These characteristics may make the plant inappropriate for your needs (or they may actually be advantages). 7. Consider the care needed. Some plants need more care than others. Mowed lawns, clipped hedges, plants with leaves/fruits that need raking and those with unusual cultural requirements all come to mind. Keep the long-term care requirements in mind when choosing plants. You may decide that a little extra time and effort will be worth it – or not. 8. Take your time. It’s best to give yourself several months to choose your plants; some gardeners need even longer. Time spent choosing the right plants is time well spent. If you feel overwhelmed or bogged down, take a break for a few days. You’ll come back with a fresh perspective; the plants may almost seem to select themselves. That’s the old creative process at work. Don’t worry if you can’t find the right plant for a specific need. You may need to consult an expert. It’s worth the time to seek out the advice you need. Don’t worry about installing all the plants at the same time. There’s no need to fill every space immediately in many situations. It’s worth taking the time to choose plants wisely. A space waiting to be filled is fine; a landscape planted with the wrong plant – just to get it in the ground - is less so. 9. Ask for help. We’ve all been there – you need a specific type of plant and can’t find one. Or you feel overwhelmed by your lack of knowledge of native plants or fruit trees. That’s the time to ask an expert (or several) for help. Take your plans to your local nursery or club/society for advice. Or take a garden design class or workshop (see our June/2014 posting). Fresh eyes – including those of fellow gardeners – can see novel solutions to your design dilemmas. The best designers seek advice and helpful comments. 10. Have fun; don’t worry that your choices are forever. Some plants (large trees; sod lawns; long hedges; etc.) are expensive to replace. Others – for example very invasive plants – can be difficult to remove. But most other plants can be replaced if they don’t work out – or you just don’t like them. Have fun. Consider using a plant that’s a little unusual – or might not work out in your climate. Use a short-lived plant that you adore, knowing that it will need to be replaced periodically. Garden design should be enjoyable - and most choices aren’t forever. Choosing Plants: examples from the garden at 112 Willow Street. In July and August (2014) we defined the plant Summary Characteristics for two garden ‘rooms’ in the garden at 112 Willow Street: the ‘Quiet/Meditation Garden’ and the ‘Butterfly Garden’. Now the gardeners need to choose several plants for the Quiet/Meditation Garden. They begin by searching for a vine/climber that meets their Summary Characteristics. 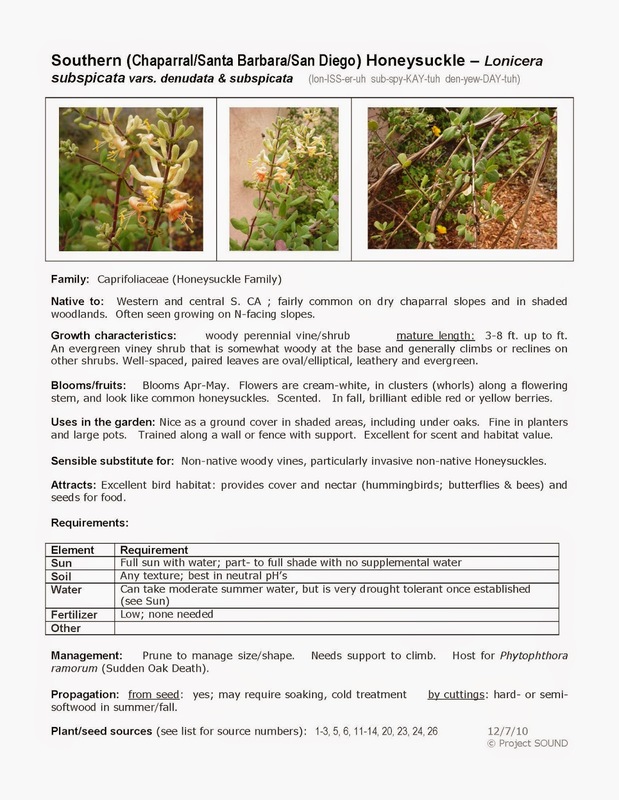 Because they live in Western L.A. County, they consult the Project SOUND Gardening lists (http://nativeplantscsudh.blogspot.com/p/plant-lists-native-plants-for-western.html), which feature native plants appropriate for their area. They are delighted to find a list for Vines & Climbers. They access the list and it’s just what they need. The list provides basic cultural requirements (light; soils; water) and the size, flower color and flowering season for a number of native vines/climbers. This makes it easy to reject plants that don’t meet their selection criteria. The gardeners are surprised to learn of several native honeysuckles and grapes. They look more closely at the honeysuckles, which do well in low-light situations. All five would grow fine in their soil (clay-loam). The Orange and Chaparral honeysuckles need a bit too much water, so these are eliminated. The gardeners now need to learn more about the Western and Southern honeysuckles. They access the Project SOUND Native Plant Gallery (http://nativeplantscsudh.blogspot.com/p/gallery-of-native-plants_17.html), select ‘L’ for Lonicera and open the file (first click on ‘save this presentation’; then choose to ‘open’). Oh joy, garden information sheets and additional photos are available for both honeysuckles! The Southern Honeysuckle looks made to order. The plant requirements are perfect for the location. The plant has pretty, aromatic flowers that attract hummingbirds and occasional butterflies. The birds eat the fruits – or the gardeners can use them themselves (with a bit of sweetener). The plant fits the ‘Food for all’ theme and seems an attractive addition to the Meditation Garden. After reviewing the pictures, the gardeners are sold on the Southern honeysuckle. The vine is evergreen, can be trained to grow on a trellis and has medium-dense foliage. They want to observe this plant in a garden, but are confident in their first choice for a vine. See how easy it is, when you know what you’re looking for? All the work spent defining the plant characteristics really pays off. The gardeners want to be sure that the plant is available in S. California native plant nurseries. Both the Project SOUND Plant Lists and the Information Sheets list Plant/Seed sources for each plant. 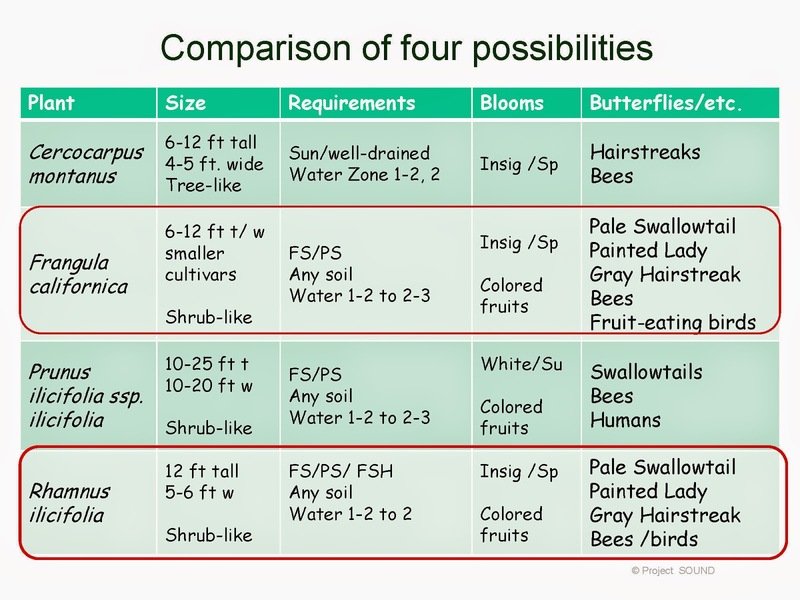 The numbers refer to a list accessed through the ‘Where to buy native plants’ page: http://www.slideshare.net/cvadheim/southern-california-native-plant-seed-sources-1213 . 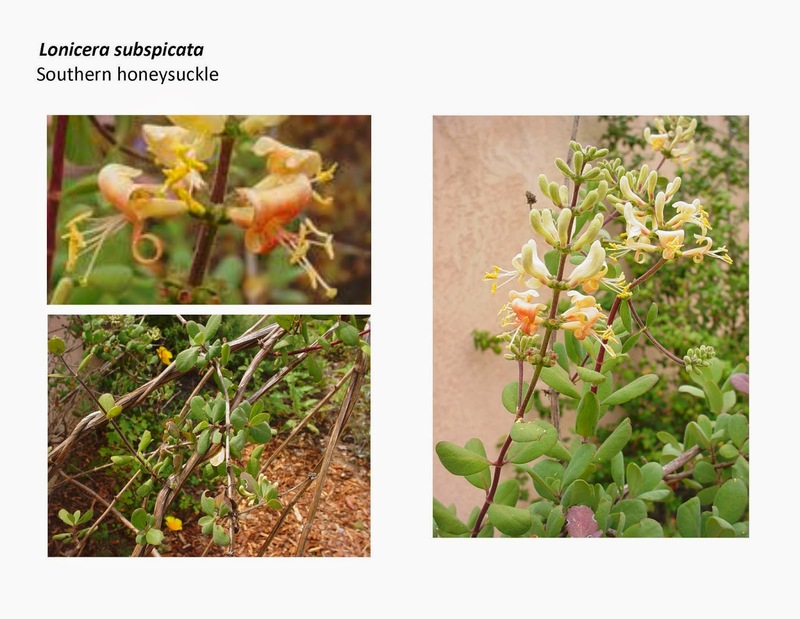 Fortunately, the Southern honeysuckle is readily available at nurseries such as Natural Landscapes, Theodore Payne Foundation and others. Southern honeysuckle seems a good choice. Choosing low groundcover plants presents more of a challenge. The gardeners first focus on a very low-growing plant for around the walkway pavers. This area sets the tone when entering the Quiet/Meditation Garden. It gets a little more sun than other parts of this garden room. The plants should be very low (6 inches or less), evergreen and aromatic if possible. They must take occasional trampling. 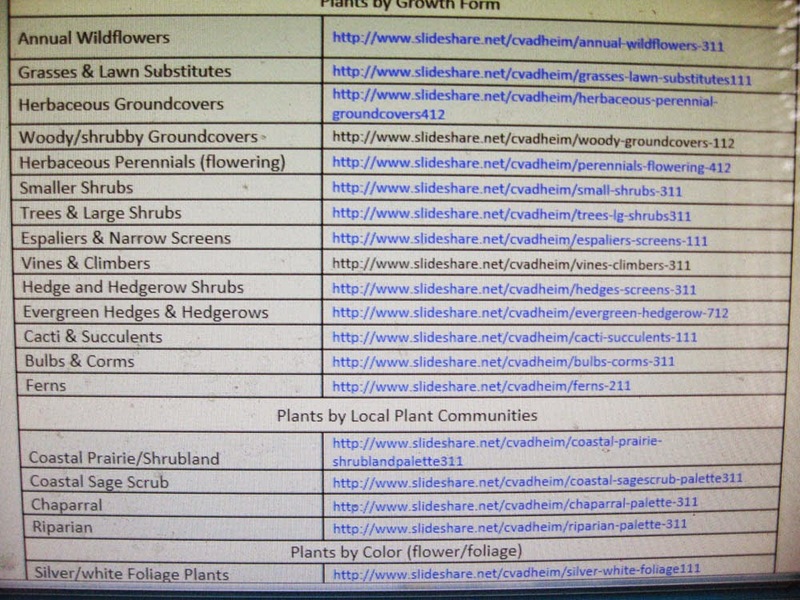 The gardeners first consult the Project SOUND lists (Herbaceous Perennial Groundcover Plants - http://www.slideshare.net/cvadheim/herbaceous-perennial-groundcovers412). The list reveals a few possibilities but a quick look at the garden information sheets is discouraging - these aren’t what they had in mind at all! The gardeners will need to consider non-native alternatives. If chosen according to the same criteria, the non-natives should work just fine in conjunction with the native plants. The gardeners search the Sunset Garden plant finder for a groundcover that is low-water use, part-shade tolerant and 0-1 ft tall. The plant finder returns a number of options, some readily rejected. But two plants look interesting: Creeping thyme (Thymus polytrichus britannicus) and Wooly thyme (Thymus serpyllum). 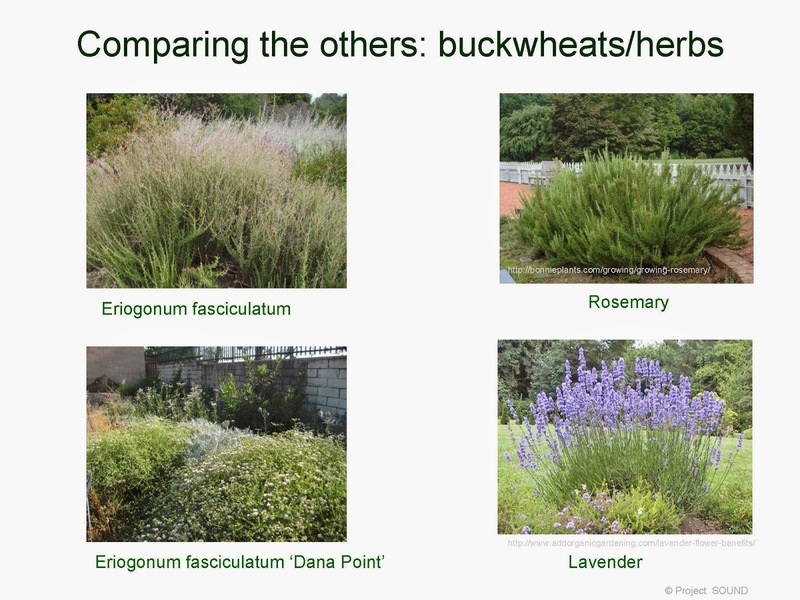 Both are evergreen, scented and can grow around pavers. The gardeners like the look of the Creeping thyme; a check (on-line) of local nurseries shows it’s also readily available. They tentatively add Creeping thyme to their plant list. They will search the internet for any disadvantages and/or alternatives to their choice. They like the idea of using an herb – it helps tie this area to the ‘Vegetable Garden’ and the ‘food for all’ theme. 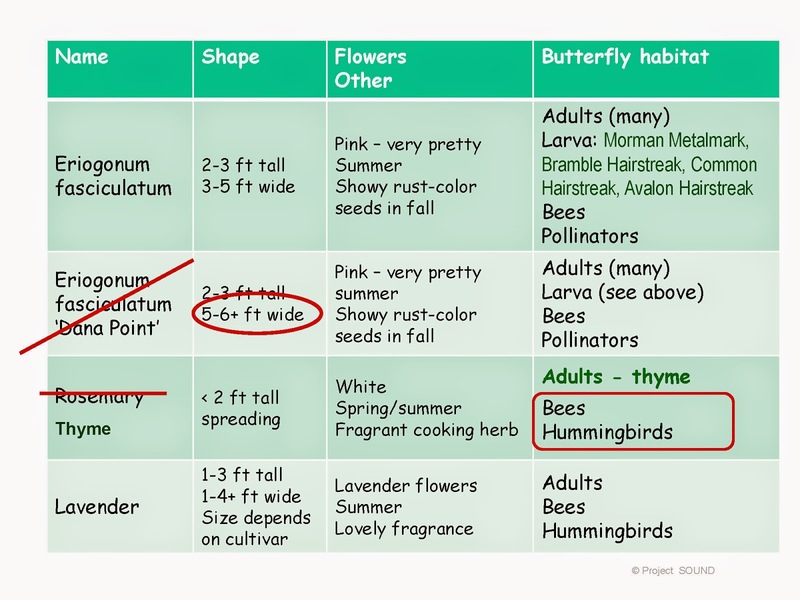 Last month, the gardeners defined the Summary Characteristics and mapped representative plants for the Butterfly Garden. Habitat gardens – those providing food and other needs for living creatures – require careful planning to insure appropriate plant selection. Plant lists for several types of habitat gardens are included in the Project SOUND Gardening lists. In the case of 112 Willow Street, the gardeners want to provide food for both adult butterflies (nectar sources) and for caterpillars (larval food sources). A quick look at the internet tells the gardeners that caterpillars can be picky eaters – they often need specific food plants. That’s why native plants are usually better butterfly plants than non-natives. They are more likely to provide suitable food. 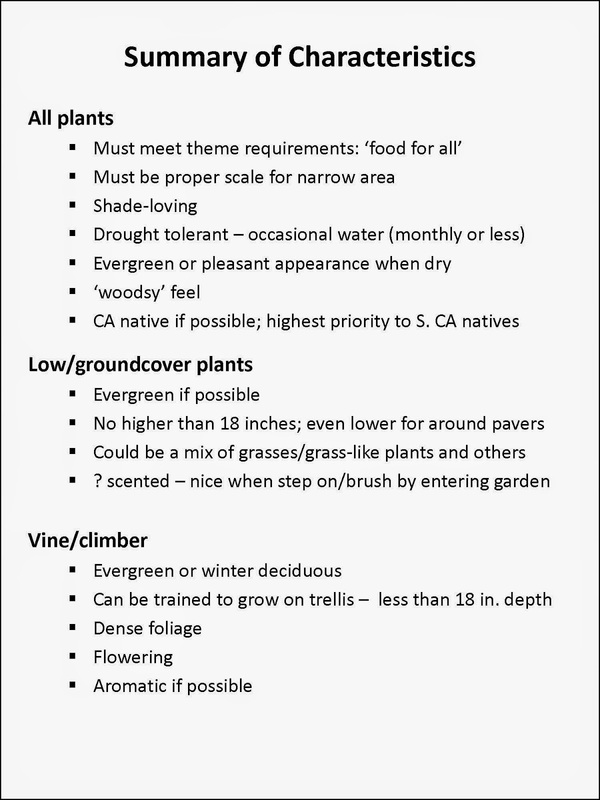 Fortunately, butterfly plant lists are available for S. California gardeners, including several among the Project SOUND Gardening lists (under ‘Habitat Plants’). We’ve also provided links on the ‘native plants for butterfly gardens’ page: http://mother-natures-backyard.blogspot.com/p/native-plants-for-butterfly-gardens.html. If the gardeners were interested in providing habitat for certain butterflies, the ‘South Bay Butterflies and Their Food Sources’ list would be most helpful. Since they want to attract as many species as possible, they focus on the ‘Butterfly – Adult Food’ and ‘Butterfly – Larval Food’ lists. The Adult and Larval plant lists contain a number of plants in the Tree and Large Shrub sections. Some plants occur on both lists; those might provide the most value for the garden, but only if they meet the other criteria. But how to choose amongst them? At this stage, comparing photographs of the plants can be extremely useful in eliminating some competitors. Size, foliage color and shape can easily be evaluated and compared. The gardeners create a pictorial line-up of the 6 top contenders, using photos from the internet. They immediately realize that Ceanothus cuneatus (a more local Ceanothus than those on the lists) is far too big for their space. It is eliminated. 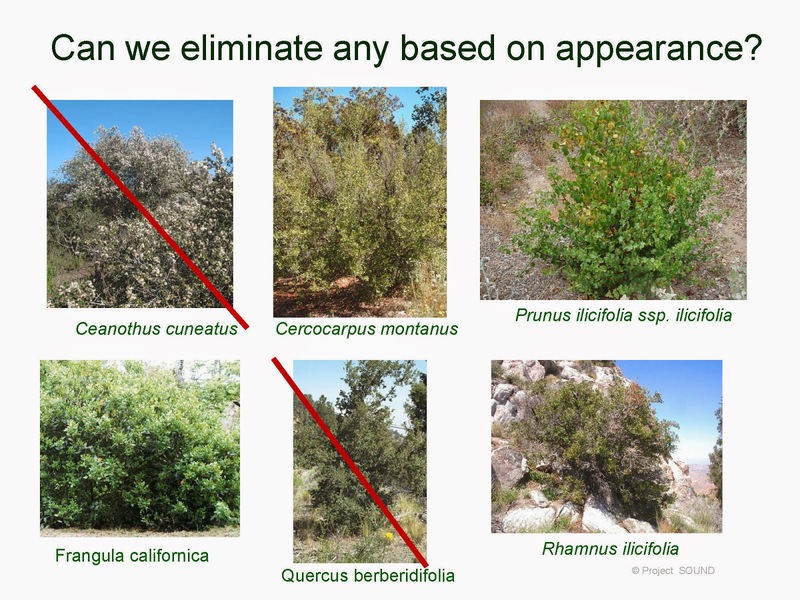 The Scrub Oak (Quercus berberidifolia) is a ‘little too scraggly looking’, so it too must go. All the rest appear appropriate. They next create a table to help them clarify the differences between the last four contenders. The table includes the key features that will help them differentiate between the options. 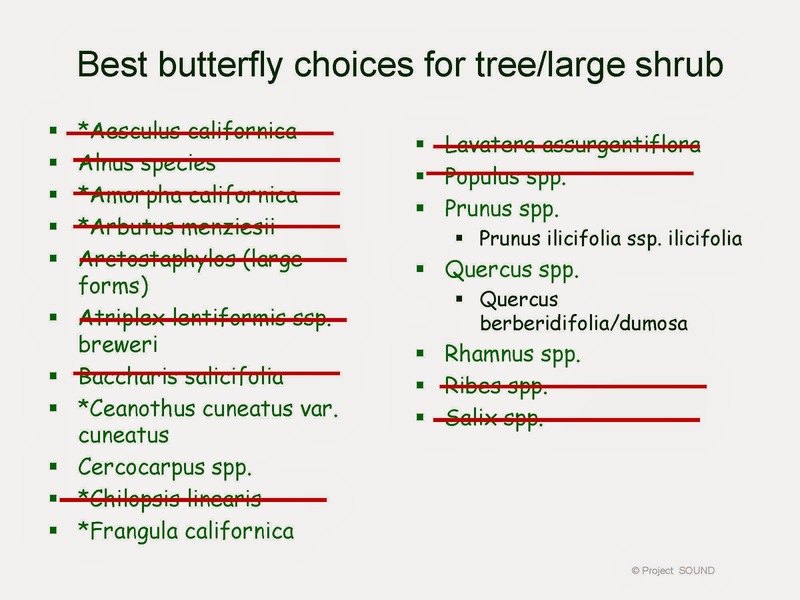 In terms of providing butterfly habitat, Frangula californica (California coffeeberry) and Rhamnus ilicifolia (Hollyleaf redberry) are the clear winners. The Redberry is probably a better size, although Coffeeberry cultivars deserve a closer look. The gardeners e-mail their local native plant garden for advice on where they can see these plants in a garden. At the very least, they want to see them in a nursery before making their final selection. The 6 foot shrubs, used as shorter background plants, will supply much of the butterfly nectar. With some slightly smaller mid-ground shrubs, they must provide foliage color and, if possible, a long bloom season. After consulting the Project SOUND Adult Butterfly list, the gardeners create a list of possible native plants. Their list targets Salvias (sages) and Buckwheats (Eriogonum species), both of which are used by many species of butterflies. They learn that some non-native shrubby herbs are also good nectar sources; these might serve double duty as herbs and butterfly plants. They add several to the list. The Black sage (Salvia mellifera) and Giant buckwheat/St. Catherine’s lace (Eriogonum giganteum), both fine butterfly plants, are rejected as too big. The rest are all possible contenders. 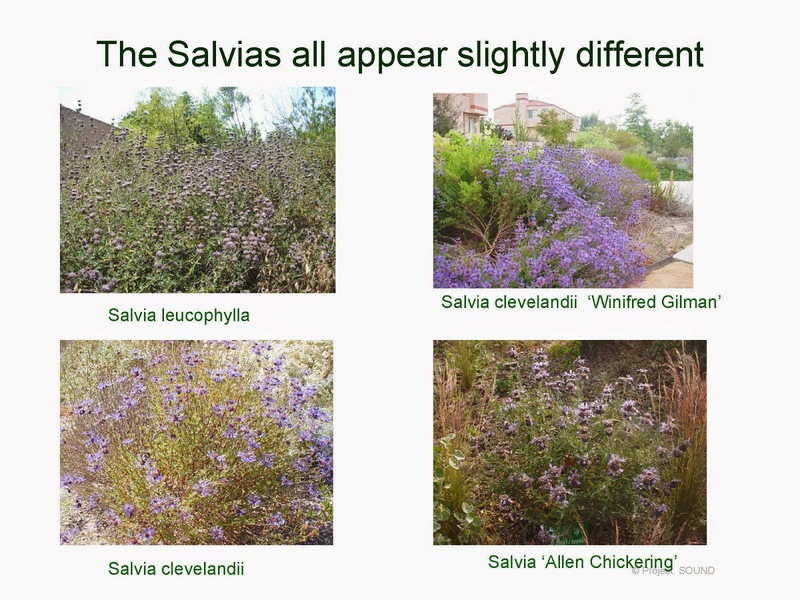 Reviewing pictures of the native Salvias (Sages) is quite helpful. The different sages really do look different. 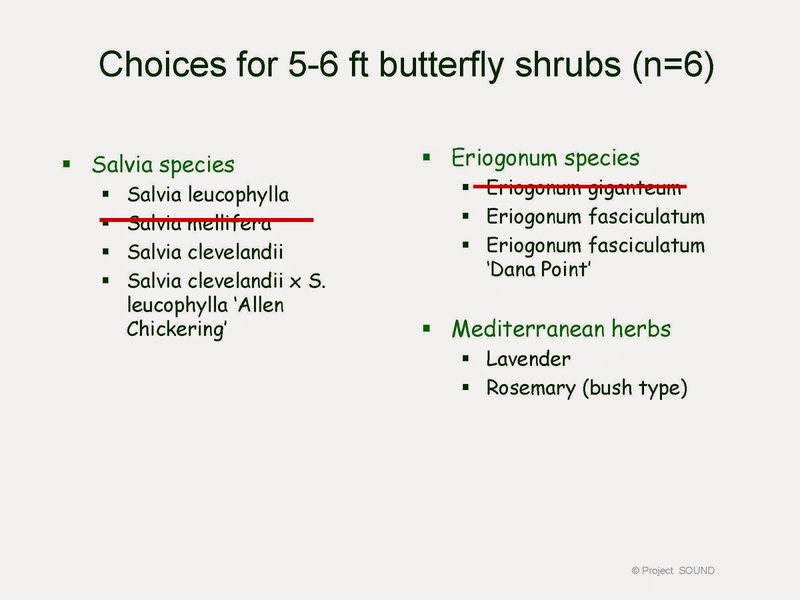 When their features are compared (below) it’s clear that all will be good butterfly plants. 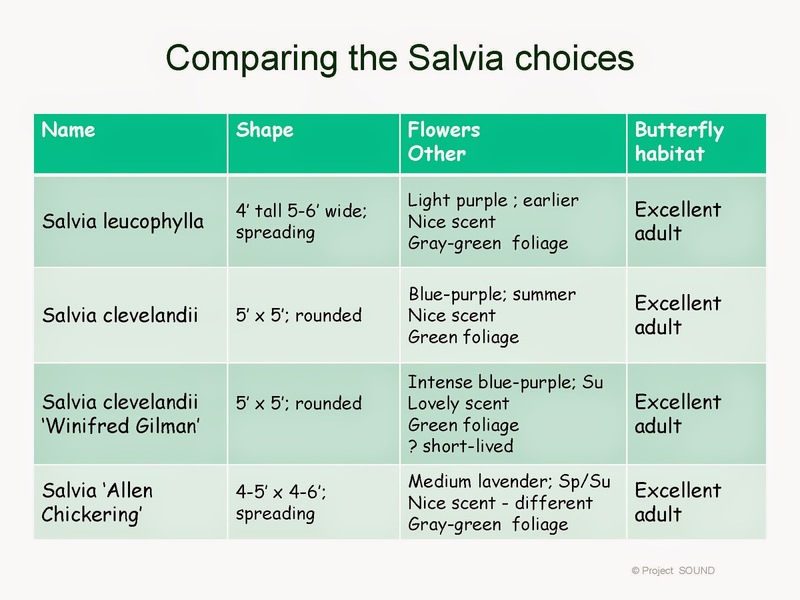 The gardeners need to select two Salvias. If they choose one with gray-green foliage, they can increase the variety in their Back/mid-ground plantings. The gardeners will want to see the plants in person – and smell their aromas – before making their final selections. The other potential plants for the mid-ground all look somewhat different from the sages. The gardeners are pleased! Aesthetically, the foliage colors, shapes and growth habits of each plant would work well with the salvias, providing a little added variety and contrast. But will they fulfill their mission as butterfly plants? Are there disadvantages to any of them? The gardeners review the Plant Information Sheets and internet resources. The ‘Dana Point’ cultivar seems just a bit big for the limited space. A call to the local native plant nursery confirms that this cultivar will indeed become large! Better to stick with the straight species California buckwheat (Eriogonum fasciculatum). The Rosemary, while a wonderful herb and bee/hummingbird plant, doesn’t provide butterfly habitat; it must be rejected. The gardeners substitute Thyme, a different look but much better butterfly nectar source (they just searched for ‘herbs for butterfly garden’ on the internet). The Thyme will repeat the Creeping thyme used in the Quiet/Meditation Garden. And the leaves will be welcome in the kitchen. By this time you probably understand how to approach plant selection. The key is to first develop a good list of Summary Characteristics. That defines what you’re looking for. Next, consult local resources to choose the actual plants. If good resources exist for your area, it’s easy to reject inappropriate plants and focus on the best alternatives. This is true whether you’re choosing locally native plants or non-natives that do well in your area. We’ve focused on plants and resources for Western S. California. But the list of Summary Characteristics could be used – with slight modification - for any similar climate and garden. The plant choices, of course, will be different in Australia, South Africa or Portugal. But the list of Summary Characteristics – the basis on which the plants are chosen – would just need a little ‘tweeking’ to reflect soil and other local conditions. Once you’ve narrowed the list of contenders, we suggest creating a photo line-up. Seeing the alternatives side-by-side can be quite revealing. Some alternatives can be rejected immediately – they simply won’t work with the space or design requirements. Or you just think they’re ugly! Once you’ve compared the contenders visually, create a table of the key characteristics for each remaining plant. As you’ve seen, this can be extremely helpful in eliminating inappropriate choices. Once again, the principle is to limit the number of contenders and then compare them – head to head. Finally, take your (limited) list of candidates and learn more about them. Visit a garden or nursery to see, smell and touch them. Talk to other gardeners about their experiences with them. Consider carefully their mature size and other possible disadvantages. Check to see whether the plants are available for purchase. Once you’ve developed a final plant list, revise your planting plan to reflect your final plant selections. At the very least, modify your map plan to reflect the true sizes (and numbers of) the selected plants. 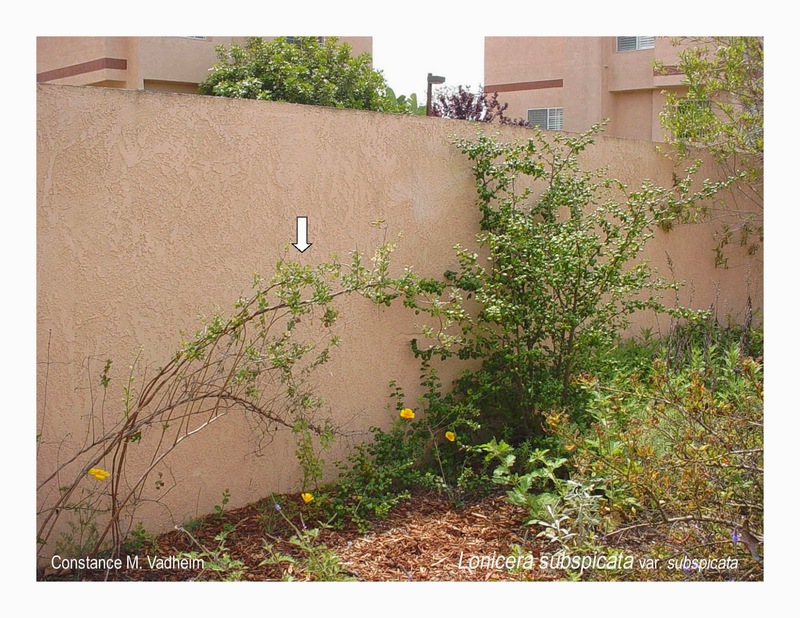 You may also want to use photos of the actual plants to revise your elevation plan. This extra step allows you to fine-tune the planting plan to provide the best arrangement in terms of contrast, variety and the other design principles. 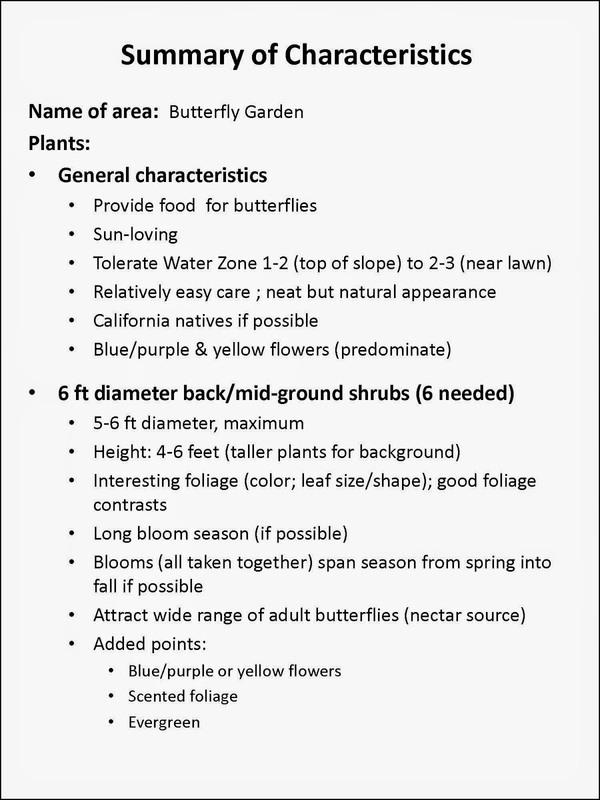 If you want to see the final plant list and planting plans for the Butterfly Garden at 112 Willow Street visit http://www.slideshare.net/cvadheim/beautiful-butterflies-2014 . You will learn more about why certain plants were chosen and the types of butterflies that will likely visit the garden. You’ll be surprised and inspired by what’s possible in this small garden. See you in November, as we begin our new series, Maintaining Your New California Garden.